Flooring can set the tone for any home. It can serve as a neutral backdrop, or it can be bold and stately. It can define a single room, or it can flow seamlessly throughout an open-concept floor plan, making the home cohesive. The options are endless. One thing is for sure — your flooring needs to function well with your lifestyle. If you are looking for a natural material to be installed throughout several rooms in the home, consider hardwood flooring. With Indiana’s ever-changing weather, engineered hardwood flooring is highly recommended. 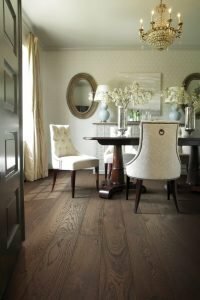 Wide planks, hand scraping and lighter toned woods are the most popular styles seen nowadays. If you have a family and need something softer, carpet may be your best option. The variety of patterns, textures and colors available make carpeting anything but ordinary. If you live an active lifestyle or have pets, Shaw’s Life Happens Waterproof carpet is just what you need. It is designed to withstand everyday messes and mishaps. Not to mention it’s warrantied against pet claw snags. 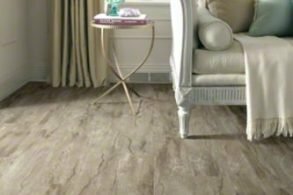 If you are looking for a different type of waterproof surface, consider Luxury Vinyl Plank flooring. It’s nothing like the sheet linoleum you are envisioning in your head. Vinyl has come a long way. HD images, beveled edges and alternating plank widths all help to make this material look more realistic but at a portion of the price of the real thing. Don’t dismiss this option without seeing the product in person. Of course, there is tile, too. With hundreds of different styles, patterns and textures to choose from, tile allows for maximum creativity on the floor. Tile can be mixed and matched and can be installed in a variety of different layouts. It’s low maintenance and easy to clean. The downside: on average, it is the most expensive flooring option on the market. If you are looking for something more eco-friendly, check out cork or bamboo. Cork is a little more forgiving and softer on the feet. Contrastingly, bamboo is a bit better equipped to withstand scratches and dents due to its density. There are several options available when it comes to selecting flooring. To get a better understanding of which products are right for your home and to see a large variety of styles available, please set up an appointment with one of ACo‘s knowledgeable designers by calling 317-575-9540.